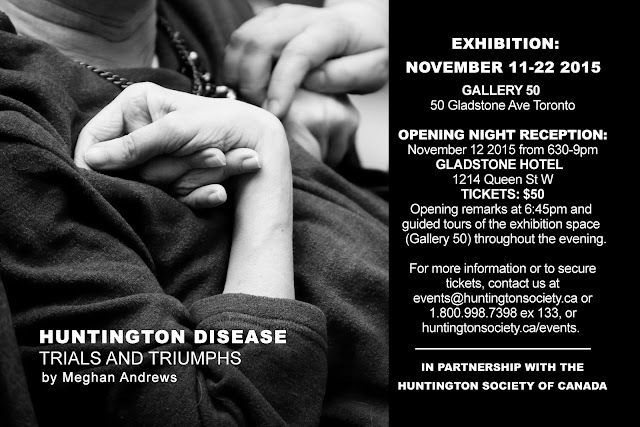 The purpose of this photo project is to bring awareness to Huntington Disease (HD) through photographing various families affected by the disease. I would like to show that even though the a family may go through difficult times, that they are still supportive, loving, and willing to rally around their loved ones no matter what. Thus, I want these photos to highlight strength, courage, and positivity of each of the families showcased. During the completion of this project, I will travel throughout Canada to capture bits of daily life of those dealing with HD. It will show different people with their families, each at various stages of their disease. Showcasing the family along side the person who has been diagnosed is important as the disease affects everyone in the group. To date, I’ve photographed several families in the Toronto area, and a collection of families in Manitoba, Alberta, British Columbia, PEI, and Nova Scotia. The photographs will all be black and white, and there will be about 3-4 images as a series per family. In total there will be approximately 35 prints. The photos will be framed in various sizes and displayed as a photo collage on the wall. The images will range in size from 27.5 x 20 inches, to 8 x 10 inches. There will also be a small write-up beside each print, telling their story of dealing with HD. Since I hope to use this project to raise funds for the cause, I also plan to have a photo book for sale that showcases a collection of these images. I recently returned from Winnipeg where I premiered my 21 framed photos to the HD National Conference from Oct 24-26, 2014. My photos were on display, as well as my photobook I created, which contains up all of the families I documented. I am also hosting an exhibition of my photos at Gallery 50 in Toronto on November 11-22nd, 2015. I feel that it would be a story with the ability to reach out and touch gallery patrons. My hope is to leave a lasting impression on those who encounter this exhibit, raise awareness about the prevalence of HD and share this underlying sense of hope with a larger audience. My love of photography started at a young age; documenting my travels and taking photos of family and friends eventually led me to become a freelance photographer. I love working with people and enjoy the challenge of finding creative ways to showcase their personalities. My father suffered from Huntington Disease and eventually passed away from it in 2004. It was always hard for me to watch him struggle; he grew progressively worse until he could no longer walk, talk, or feed himself. After he passed away I was tested for the disease and was shocked to find that I also have HD. After finding out, my world stopped. As it turns out, my gene repeats are high, which means my HD is faster acting and progresses quicker than the average person. For awhile I was upset about the results, but eventually my friends and family helped me through it, and I was trying to think of how I could turn my results into something positive. Shortly after my diagnosis, I started volunteering in the Toronto Chapter of the Huntington Society, and I quickly became their resident photographer, event planner, and now ultimately, the vice president for my chapter. But I couldn’t shake the feeling that I wasn’t doing enough for HD, and I wasn’t actually helping anyone on a larger scale. I tried to think of what I could do, and how my work could help the cause. It was with all of this in mind that I decided I could use my photography talents to document families who are also affected with this debilitating disease. I hoped that by documenting an entire family, I could illustrate how this disease affects not only the patient, but also the family as a whole. I have found this whole experience to be an incredibly healing one. Seeing the strength people have at different stages of HD has really empowered me. My attitude has shifted for the better; I constantly find myself thinking, “If these people can get through this with a smile on their face, then so can I.” It is truly inspiring.